A decrease in the number of new listings resulted in limited sales growth within the Calgary housing market during the month of March. Resale homes have also been selling in less time, despite theupward pressure that has continually been placed on Calgary housing prices. 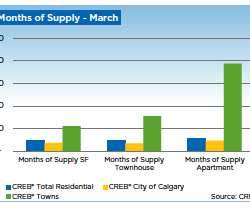 According to CREB, March 2013 saw the lowest level of active homes for sale in over five years. New listings were five percent lower in 2013 than they were in 2012. Furthermore, they dropped five percent when compared to the first quarter. While the 4,006 listings in March represents a higher number than February, the figures are well below where they were last March. Active inventory fell to 2,713 units, which is 22 percent lower than 2012 figures and represents the lowest March inventory levels since 2007. Crystal is on top of technology and how it can benefit her clients. She's clearly interested in the betterment of the real estate industry. Definatley someone who cares.